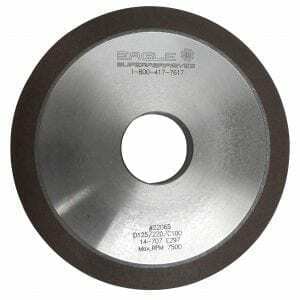 Eagle Superabrasives, is a premier supplier of superabrasive supplies located in the United States. With an extensive inventory of over 6,000 diamond, cbn wheels and cdx wheels in stock at our Hickory, NC headquarters, we are able to ship ninety-percent of orders same day. Custom orders can be filled in as little as seven days. CBN is a man made material that comes from the cubic form of boron nitride. CBN consists of the same structure as that of diamond, however, boron atoms replace the carbon atoms. Replacing the carbon atoms with boron, allows CBN Wheels to work well with ferrous materials because there is no chemical reaction taking place, which eventually breaks down the wheel. The benefits of implementing a CBN wheel into the workplace are amazing if you’re looking for a wheel that provides a long wheel life, less wheel changes/ dressing and high thermal stability. In the past, Diamond wheels have always been the “Go to” superabrasive when machining difficult to grind materials (DTG). However, Diamond is not able to work with ferrous materials and loses hardness in extreme temperatures that are often generated in the workplace. Contrary, CBN is able to machine ferrous materials because its borazon atoms replace the carbon atoms that are impacted by ferrous materials, allowing it to stay hard and preserve its strength. If you would like to read more about CBN Wheels click here. As mentioned before, diamond loses its hardness under intense heat. There is a significant significant advantage of CBN’s thermal stability over diamond. Diamond begins to lose a significant amount of hardness at around 700 degrees while CBN remains unchanged at over 1,000 degrees! When you’re ready to try the best, trust the experts at Eagle Superabrasives. As well as providing high performance grinding wheels, we offer high performance customer performance will provide superior support and advice along the way. Contact us today!